Just what Maryland gardeners have been waiting for…a brown marmorated stink bug chomping, slurping, eating machine! 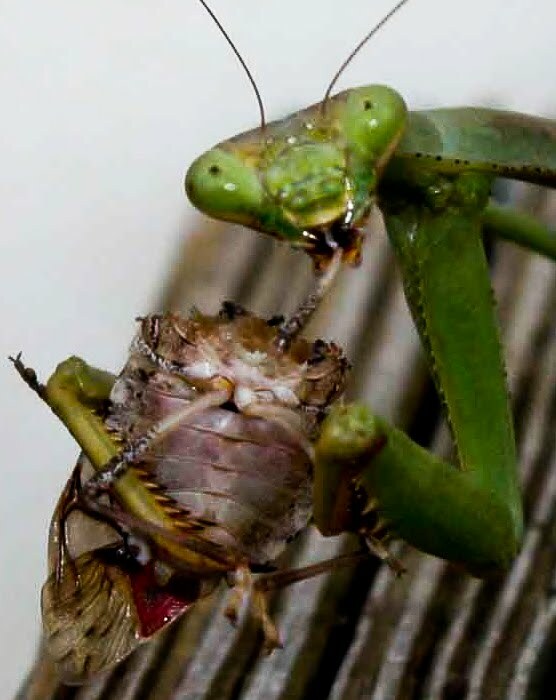 This photo of a praying mantis devouring a BMSB was sent to us by Howard County Master Gardener Susan Levi-Goerlich. What would be a great caption for this photo? What- you never saw anyone eating a BMSB before? Don’t watch me while I eat. Aaaack – I thought you said marmalade bug! Let’s see how many captions you can come up with! I have a great praying mantis photo from yesterday, but it's eating a bumblebee. I kept telling it, no, don't eat the bees, but it wouldn't listen. And you all thought I only ate grasshoppers! No thanks to the plum sauce, but do you have any ketchup? Need some Grey Poupon ! !